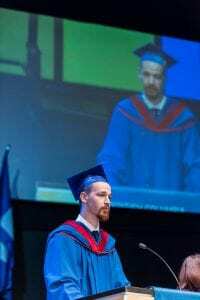 Approximately 1,500 BCIT students become BCIT graduates this week during the British Columbia Institute of Technology’s 2018 spring convocation ceremonies. 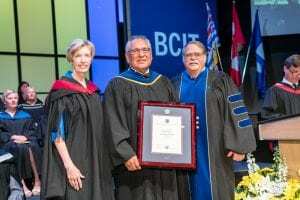 They join a renowned group of over 175,000 BCIT alumni who—for over 50 years—have contributed meaningfully to the social, economic, and environmental prosperity of British Columbia. Congratulations to all our graduates, their families, friends, and instructors. Photos and video from each of the five ceremonies is available below. To access individual graduate photos, please visit order.mountainwest.ca, and enter your email address along with this code: BCIT2018. The photos will be available within one week of your graduation date. Don’t forget to check out the photos taken at the Gold Fish photobooth. 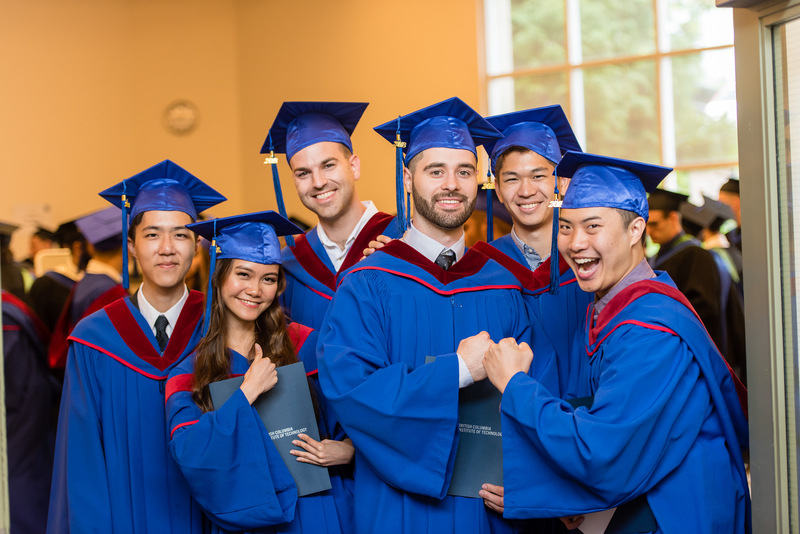 Our first ceremony celebrated graduates from the Marketing Management, Accounting, Finance, and Insurance programs in the BCIT School of Business. Keynote speaker Sue Paish, Q.C., CEO, Digital Technology Supercluster, was recognized with a BCIT Honorary Doctorate of Technology, given to individuals who are widely acknowledged for outstanding and sustained achievement in their area of expertise. “We also know that because of the way BCIT runs its programs you’re results-oriented, you’re hardworking, you’re a multi-tasker, you’re determined, you’re resilient, you’re trustworthy and you’re honest,” she added. Watch the full video of Sue’s speech below. The valedictorian for the ceremony was Quinton Silzer, graduating with his Diploma of Technology in Accounting. Check out the photos from the June 20 morning ceremony on Flickr. Valedictorian Dean Tamboline, Bachelor of Engineering, Mechanical Engineering, addresses the audience. Our second ceremony celebrated graduates from the School of Energy and School of Business Business Administration program. “I encourage you to choose your ‘why’ carefully. Make your passion your work and your work your passion. Never stop trying to have a positive impact on the world,” she said. Watch Jill’s full speech, below. The valedictorian for the ceremony was Dean Tamboline, graduating with his Bachelor of Engineering, Mechanical Engineering. View the photos from the June 20 afternoon ceremony on Flickr. Students from the Broadcast and Media Communications, Digital Arts, Business Management, Business Operations, and Human Resources celebrated their graduation at the June 21 morning ceremony. Keynote speaker Rick Cluff, Journalist and Communications Consultant, spoke to the audience about the transformative power of saying “yes” during his distinguished broadcasting career, most of it spent at the CBC. Watch Rick’s full speech below. The valedictorian for the ceremony was Phillip H. Lee, graduating with his Diploma of Technology in International Business Management. View photos from the June 21 morning ceremony on Flickr. View photos from the June 21 morning ceremony. Our fourth ceremony, held on the afternoon of June 21, celebrated graduates from the School of Computing and Academic Studies and School of Health Sciences. Our valedictorian for this ceremony was Megan Euverman, who received her Bachelor of Science in Nursing. View photos from the June 21 afternoon ceremony. David Tuccaro, President and CEO, Tuccaro Group of Companies, was awarded an Honorary Doctorate of Technology. Our final ceremony saw students the School of Construction and the Environment and School of Transportation don cap and gown. focus on the areas of demand so that students can take advantage of full-time positions in specialized areas in the economy. 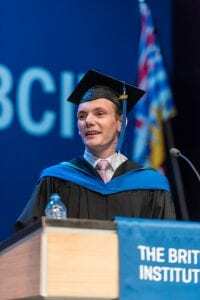 BCIT graduates can take that diploma anywhere in the world,” he said. The valedictorian for our final ceremony was Justin Perry, who graduated with a Diploma of Technology in Forest and Natural Areas Management. View photos of the June 22 ceremony.